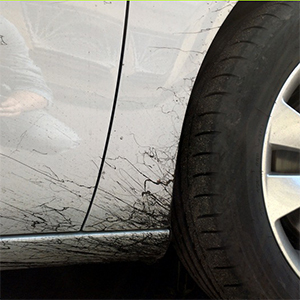 Tar stains getting onto the surface of the auto body from the asphalt coating can cause serious damage to paint coating of the auto body. In summer light oil fractions contained in asphalt penetrate the enamel and lacquer layers when in contact with the paint coating. It is especially damaging for metallic and pearl paints, as well as for two-layer one-color coatings, because asphalt penetrates the surface much faster by contact with lacquer. Gradually the tar substance solidifies and if fresh tar stains are easy to remove even after one moistening, hard solidified asphalt is more difficult to deal with, because a thick layer of hardened asphalt needs to be gradually dissolved with a cleaner. In winter tire studs intensively accumulate asphalt microparticles on their surfaces. These microparticles mixed with winter thawing chemicals get onto the auto body and form a layer of contaminations with high paint adhesion which is very difficult to remove. Use Tar stain remover or VERYLUBE Universal cleaner. Consequences of tar stains can be significantly reduced if the auto body is protected by VERYLUBE Lacquer coating polish or Red Penguin Hot wax – concentrate for final treatment of the auto body after washing. After removing the asphalt and tar from a paint coating there can stay traces of old stains — grey ones on dark cars and yellowish on light cars. Before removing the stains, wash the car in order not to scratch the paint coating during the process of tar stain removal. Only new stains which formed within 24 hours are easy to remove. Old stains need to be removed step by step, layer by layer. It is not recommended to apply great force or scrub the coating with a cloth to speed up the cleaning process, because you can damage the coating even more severely.